The National Kidney Foundation of Kansas & Western Missouri, with medical support from Children’s Mercy Hospital and Clinics, is excited to host a fun and unique summer camp experience. 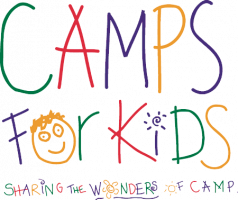 Camp ChiMer is a 5-day overnight summer camp for children ages 9 to 18 who are undergoing peritoneal dialysis, hemodialysis, or have had a renal transplant. Campers will have the chance to participate in exciting activities like fishing, team-building activities, rock wall climbing, sports, learning to cook, making lifelong friends, and yes, even swimming in our filtered pool. We also offer off-site activities such as going to a local sporting event or attending a dance party. Camp ChiMer is located in a beautiful 100-acre privately owned facility in Kansas City, Missouri. Camp will be staffed by physicians, nurses, dietitians, pharmacist, social workers, and volunteers 24 hours a day. Campers are medically-supervised and dialysis treatments will be provided on-site. Campers form friendships and share common bonds and experiences with others who are “just like them” all while enjoying the therapeutic benefits of the great outdoors.